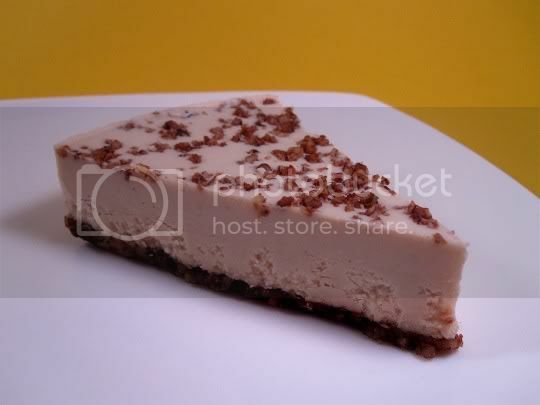 Raw, vegan cheesecakes...that are absolutely out of this world! Who knew? Well, the folks over at Earth Cafe did, and lo and behold...they've come up with a sweet, creamy, indulgent, OMG-I-can't-believe-there's-no-dairy-in-here delicacy. The word "cheesecake" is used loosely here: there are absolutely no dairy or eggs used in these delicious desserts, so go ahead and eat up, guilt-free! 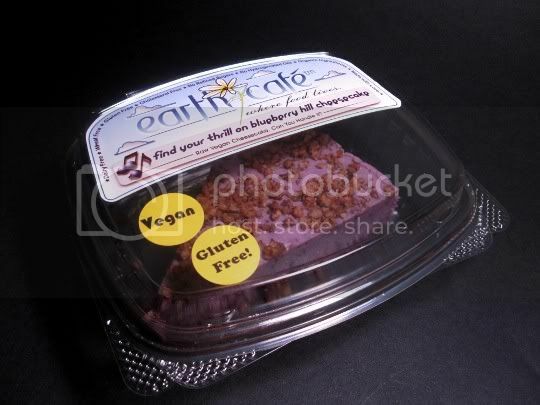 Earth Cafe features 10 different cheesecake flavors, sold in slices or whole cakes. They all have the same nutty crust: a mix of soaked and ground walnuts, almonds, and pecans. There are also strong cinnamon notes; a little too much salt is used, but the sweetness of the fillings are a perfect contrast for your taste buds; these slices are literally bursting with flavor. 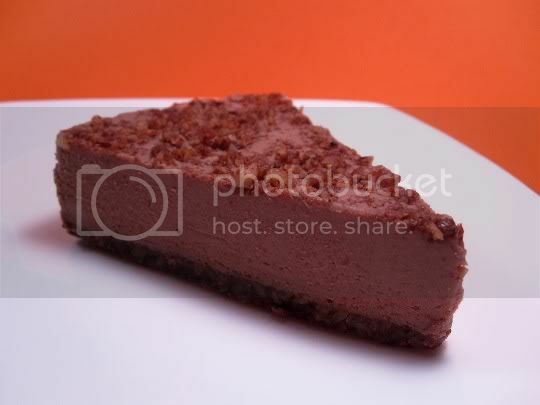 I usually don't even like nuts in my desserts and/or baked goods, but the crust had a great texture, crunch, and nutty flavor, and served as a great base. This same crust mixture is sprinkled atop each slice for some extra nutty crunch. The main ingredients here that create the "cheesecake" texture are--wait for it--raw soaked cashews and coconut butter. The texture is slightly grainy, but strangely enough, there IS something cream cheese-y about it...and there even seems to be a slight dairy aftertaste! Amazing! Rockin' Raspberry Cheesecake: This was the first flavor I tried, and what a great choice I made. 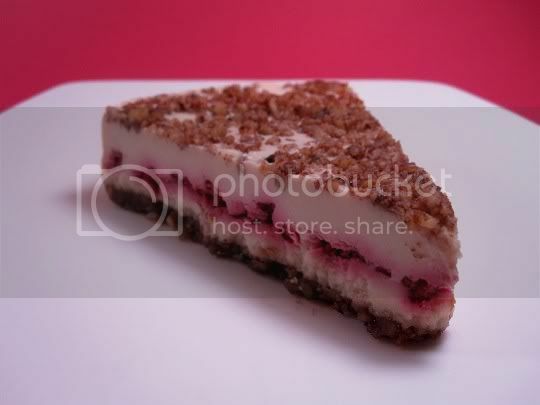 If you're hesitant to try these cheesecakes (as I was), start with this one...it will make you a believer! Seriously I had no idea what to expect, but after my first bite, I was blown away. The filling is tangy and sweet, with that great salty contrast from the crust. A layer of fresh, juicy raspberries fills the center. The only thing that would make this even better would be the addition of some kind of chocolate crust. OMG! Cali Style Lemon Cheesecake: This cheesecake was good, but I was expecting it to be a little more lemony and tangy. The texture was great: creamy, yet firm. I'd love to see a lemon curd-like filling for this, similar to the fruity filling for the Rockin' Raspberry flavor. Strawberry Fields Forever: Similar (in both texture and flavor) to strawberry yogurt. Sweet, tangy, and fruity, with strawberry seeds that you either love or hate. I don't mind them, and I loved seeing and tasting bits of fruit throughout the creamy slice. 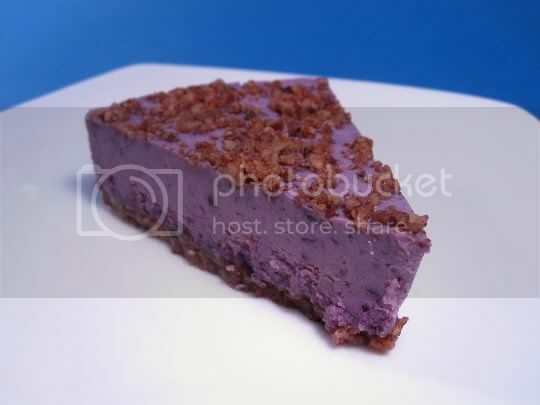 Blueberry Thrill Cheesecake: One of my favorites, this oozed with blueberry flavor and bits of the fruit...and how can you not love that color?! This seem to have the firmest and heartiest texture of all the flavors I tried. I was also able to pick up on the coconut butter taste the most here; maybe it was the blueberry combination? Anyway, this was fresh and tasty, tangy and sweet, delicious and more delicious. And the cinnamon in the crust was a great pairing with the blueberries! Who's Your Daddy? Cheesecake: Okay y'all. 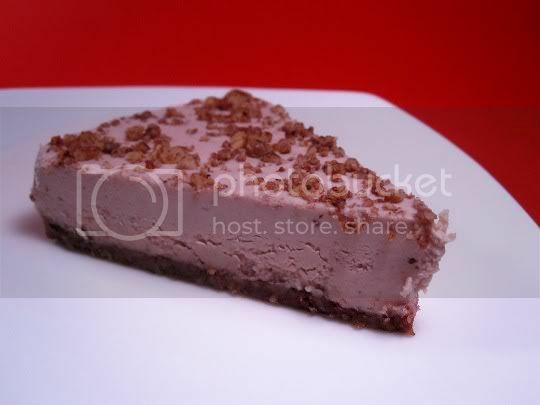 This is the mother (or Daddy, rather) of the cheesecakes...carob mousse!!! I somehow knew to save the best for last, and this flavor was absolutely amazing and addictive. Carob (often a vegan substitute for chocolate) was so sweet and mocha-like, surprisingly light and delicately sweet (but still ultra decadent), and super creamy that you would be hard-pressed to believe there's NO dairy in this. Seriously, you probably can fool the most die-hard non-veg. The flavor briefly reminded me of chocolate pudding, but with a rich texture and smoothness of mousse. Of all the flavors, I'd say this was the most decadent and dessert-like...and yes, my favorite! The best thing about these cheesecakes is that they freeze well (for months!). This means you can buy them in multiples (or wholes), take out a pre-sliced piece and thaw it in the fridge (I did mine overnight), and enjoy anytime! They held their shape and texture, and the flavor didn't change at all. you really won't believe that you're eating raw, vegan food; they're so addictive that you'll be going back for more! But slowly, because they're so rich and decadent. A couple times, I felt like I would barely be able to finish a slice! Try again? Definitely. Earth Cafe seems to be expanding their availability in stores, so run out and try some ASAP! Love their products- I reviewed them for my blog awhile ago too.